Nifty is overstretched and a bounce back from the level of 5430 is expected. This is our wishful thinking as we see a formation of death cross and it shows that bears has an upper hand and we are likely to see short term rallies which will be used by stronger hands to short the market. To make it simple death cross is the phenomenon which occurs when 50 day moving average crosses below 200 day moving average and it signifies that we have to now see the tussle between the bulls and bears for bulls to regain the control. As we can see that Nifty trend is down wef 30 Jul with reference to 20 day and a confirmed downtrend exists on the basis of 5 days swing reference since 25 Jul 13. Now we can only keep the fingers crossed to see Nifty gaining the ground above 5580 level with volumes to gather some bullish momentum as rupee positive movement may add some solace to the market. Make use of the available opportunity and trade intraday with the sure tip of the day and make money like professionals as aim is to capture the opportunity at the right moment to get the juice out of it. 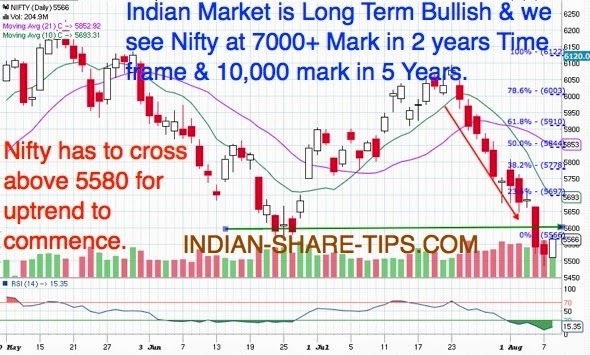 Not to panic as long term trend of Nifty will be bullish only as markets always like to be bullish and people are flush with funds including govt with pension corpus which can be infused to give a new lease of life to the market. 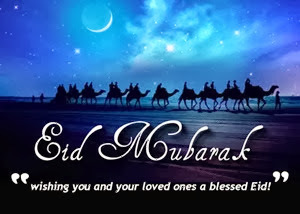 Festivals are an occasion to celebrate and we take the opportunity on behalf of our team to wish our readers Eid-ul-Fitr 2013 Mubarak and we are really impressed with the acronymn of EID which takes you to another dimension itself. The main purpose of Eid is about sharing the happiness with others, especially those who are less privileged. The whole purpose of fasting to learn self-discipline, and to realize the sufferings of the poor and we know worldwide our brethren are doing the same and let us do our bit on the occasion by taking a pledge for eye donation. We have done it; are you ready for it. Do remember to see the video on opening of the link for eye donation. Wipro, Hexaware, TCS, Infy, Tech M, OFSS, Sun TV, Biocon, Hero Motors & Titan. Finan Tech, Sintex, JP Associat, Bhel, Syndicate Bank, JP Power, KTK Bank, Yes Bank, Dena Bank & GMR Infra. If you like our post then do not forget to refer our free Indian Stock Market Tips website to your friends and colleagues. This article was first published on Indian-Share-Tips.Com on 09 Aug 2013 & we will seek your support to share the post if you found it interesting and spread the good work done by us as stock market blogging is a continous tiring task and we have been doing it for a tremendously long time. Do remember to go through the comments to know the reader views or our updates from analytical point of view. Do not miss the latest comments as we do keep on providing updates for the Nifty for subsequent days.